Originally opened in 1956, the General Motors Design Dome, designed by Eero Saarinen in collaboration with Richard Kelly, has long been classed as a ‘legendary corporate masterpiece of planning and design’. Based in Warren, Michigan, the large indoor viewing auditorium was first constructed to give the designers the opportunity to view their designs in an open space, regardless of the weather. The 180ft diameter domed space was traditionally indirectly lit with the intention ‘to provide a shadow-less environment for the evaluation of form and finish of the vehicles’. Since its inception more than 60 years ago, it has become an iconic piece of automotive design that organisations around the world have imitated for facilities of their own. 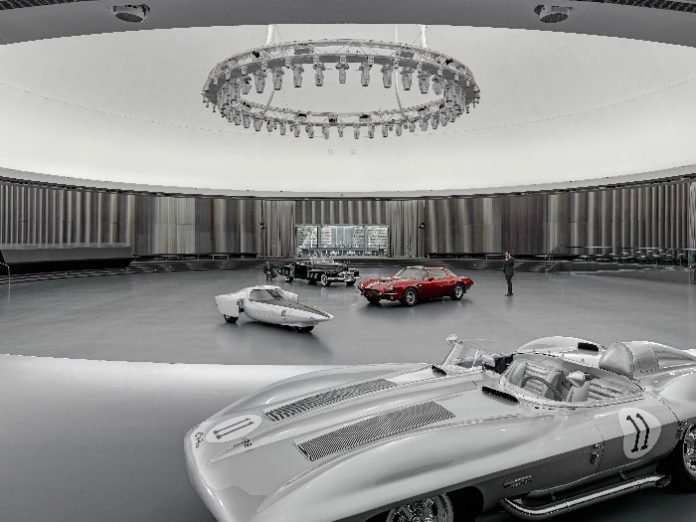 However, renovation was needed as General Motors sought to enhance the relevance of this impressive structure as an evaluation and presentation centre for critiquing, presenting and displaying the next generation of automotive product design. SmithGroupJJR, a Detroit, Michigan-headquartered architecture and engineering firm with offices across the US and China, and a staff of more than 1100, was brought in to carry out the renovation. In its work the firm pays homage to the collaboration of Saarinen and Kelly, while bringing the landmark of classic ’50s design into the modern era. The design team at SmithGroupJJR set out to modernise the facility, but to do so in a manner to complement Saarinen’s original details. This meant that the walnut wood panelling, stainless steel and aluminium used in the original design were continued throughout the renovation. During the renovation project, the team transformed the dome’s technology and controllability, re-engineering a 20-year-old system to meet the strict styling requirements that General Motors had for the dome. The outcome implements programmable layers that indirectly render a shadow-free envelope, while directly accenting vehicles with finely-tuned light spectrums. The 180ft diameter dome can be transformed through automated scenes for a variety of occasions, including new prototype unveilings, charity events and staff gatherings, while the new, entirely LED system has been designed to aid automotive design for the next 50 years, thanks to improved agility, efficiency and sustainability. 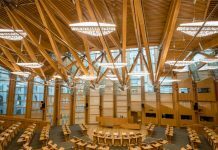 Implementing this new lighting system was done with the slightest possible intervention – the main lighting ring in the centre of the dome was replaced with a new ring of fully adjustable, fully programmable, iPad-controlled white/RGB LED lighting. The ring also required special attention in order to address the additional load placed upon it while minimising any potential movement due to the introduction of new motorised lighting systems, and existing structural members dictated architectural opportunities to mount new systems. The renovation of the dome leveraged colour to activate the architectural layers and capitalise on the building’s rich textural metal wall. Cove mounted RGB linear indirect systems infuse the ‘corporate blue’, expand the perimeter viewing platform, and allow clear definition of the impressive dome ceiling and surrounding areas. In display mode, the motorised RGBW LED directional sources provide the spectrally tunable 750lx needed to create adequate contrast while showcasing the vehicle’s particular finish within a saturated, coloured visual environment. Indeed, some of the key considerations for the new lighting system centred around the ‘stance’ of each vehicle on show, as Manriquez explained: “Indirect lighting had to balance the existing materials, target luminance and target illuminance in the dome. We designed and achieved a 2:1 luminance ratio with an average of 150cd/sqm and 300lx at the floor. Manriquez added that General Motors and SmithGroupJJR collaborated through a mock-up on site to determine best illuminance/luminance levels based on precedent operations, aiming strategies and colour tuning of the proposed LED system. Indeed, this collaboration proved essential in the early stages of the project, as understanding the metrics to light the property under different assessment conditions (i.e. direct and indirect lighting) did prove a challenge for SmithGroupJJR. However, by leveraging an on-site mock-up of the new system and watching it work, the team were able to iron out any issues. In fact, GM Global Industrial Design consulted and collaborated throughout the whole process, mocking up real use cases to establish the requirements that drove the specifications. The GM team worked with partners throughout the whole project to help share understanding of the necessary level of theatricality, and the fundamentals of lighting vehicles. More creative and expedient user programming has also been encouraged in the Design Dome with the installation of 40 DMX universes. This has further added to the colour fidelity as the flexibility of the DMX controls enable the show directors at the Dome to ‘spike the hue’ of a saturated yellow car in contrast to other monochromatic cars that appear to fade into the background. Colour as the ‘primary conductor’ establishes hierarchy and sequencing for viewing every scene. 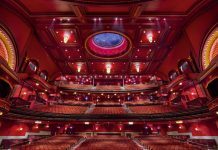 This new theatrical system also provides an energy saving of 36%. It is the introduction of these DMX universes that has enabled those at the Dome to fine-tune their lighting displays and expand the capabilities of the building. Manriquez continued: “Redundant RGB cove integration into the DMX control platform has expanded the space’s capabilities as an event showroom, while directional motorised fixtures with DMX control of aiming location, beam angle, intensity and colour allowed multiple lighting criteria to be achieved with just one system. 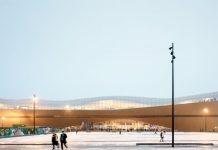 The end result is a stunning structure that, while paying tribute to the original work of Saarinen and Kelly, has been brought firmly into the modern era. Looking like something out of a James Bond movie, the Dome is the perfect blend of classic and modern design. That said the project threw a few curveballs at SmithGroupJJR with regards to working within the constraints of an existing historic structure, the technically complex, multiple program criteria of the brief and the difficulty of lighting the reflective, metallic car finish. Manriquez added that if they could have changed anything about the project, they would have added more redundancy to the systems to allow for growth of display options. But overall, he and his SmithGroupJJR team are pleased with the outcome. “The Design Dome is a grand space worthy of pause and recognition as it is the mecca of design for this organisation. We are honoured to be able to enhance that notion. “Reverence to the modernist evolution of the space relies on understanding and solving dualities: unity with variation, modern but not inexplicable, consistency without boredom, seriousness without pedantry, and function with playfulness. “We feel that we achieved a balance of two critical considerations: the respectful posture toward Saarinen’s original design and the need to move the space into the next 50 years of operations. We were sensitive to the classical historical materials that remained as clear legacy items of modern architecture.